Back in January, I wrote a post about empathy and technology. I pondered the possibility of technology like Google Glass and Oculus Rift to open up our experiences of the Other through shared perception. In April, Nicholas posted about the all-around failure of Google Glass to be, well, cool. Not particularly revolutionary and kind douchey when push comes to shove. Glassholes were born. Guys on the subway being creepsters. Concerns over the safety of driving while Googled. Most users behaved badly–doing all those things one would expect of tech geeks with 1500 bucks to spend on a computer for their face. Ms. Crabapple sketched and made art while others watched through livestream, but she felt intuitively that they watched only. What made “art art” wasn’t present. Can we expect that seeing what others see through Glass will give us insight into what they are “really” seeing or experiencing? Will technology allow allow us to see through another’s eyes in a spiritual way, for lack of a better term? Or will Google Glass, and other future and more sophisticated products, be technological navel gazing and vapid self-obsession? Glass is not the revolution it could have been, certainly, dear readers, but I remain ever hopeful that the future will transform into everything we dreamed of as VHS kiddies. Little Gen Xers dreaming of flying skateboards, TVs for our wrists, and weekend trips to the moon. We did get iPods. I may have to back off on my hopes for empathy and focus on something else. With this I present another kind of wearable tech: 3D printed fabric. The BB.suit by Dutch designer Borre Akkersdijk is truly wearable, not just carry-able. There is still serious R and D to be done, but fabric of the future could be walking web access, GPS ready, and Bluetooth compatible. Your suit as a walking URL. User experience would differ with every wearer. Alas, the prototype was quite unattractive. An ill-fitting ecru onesie. But in lieu of my iPod implanted into my arm I’ll take a wearable playlist for floating through urban space. 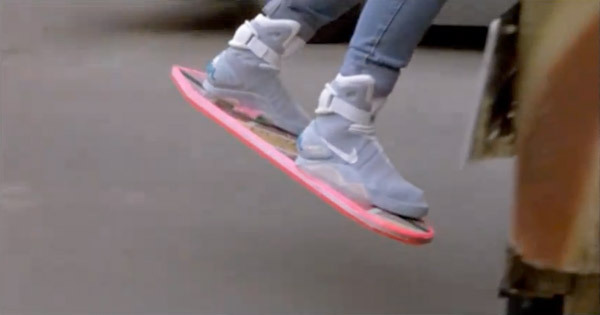 No hoverboard, but you can get Marty’s shoes. Thanks Nike! This entry was posted in Uncategorized by steffishel. Bookmark the permalink. Not sure how enhanced life seems to be by most of these tech-toys to date and wonder if it would take something more integrated/cyborg to make a more substantial difference? What’s more integrated than Prozac? Prozac is a technology, most definitely. A chemical assemblage. have you read Lanier’s new book? We should devote some serious time to that book sometime soon. Here is a review of it: http://www.jspes.org/pdfs/winter2013/JSPES38-4bookreviews.pdf if you can’t open it, just write me and I’ll send a copy. The original text of Lanier’s latest book is generally about the hollowing-out of the entire job market as digital work/digitization simply obliterates so much of the “work” (i.e., non-thinking labor or paper shuffling) and now more of the middle-class white-collar work. There is a section about education going on-line that is nice too. Worth the reading the review if not the entire book. Thankfulness to my father who stated to me concerning this weblog, this website is really amazing. therefore where can i do it please heelp out. up for the exxellent information you have got right here on this post. coverage! Keep up the very good works guys I’ve incorporated you guys to my blogroll.